Verbena is probably best known for ‘Lemon scented verbena’. Verbena chamaedrifolia is a trailing verbena. With new cultivars being released by Wholesale Nurseries every year, the flower size and colour is improving. Ready for sale in pots of around 14cm, by retailers from spring to summer when in full flower, or earlier in punnets either mixed or straight colours. Some species and varieties are also available as tubestock and and smaller pots. Trailing types that are suited to growing in hanging baskets will generally reach around 25cm in height with a spread of twice this. A few exciting new colours including the red and white flowering ‘Candy Cane’ and ‘Twister Pink’ both with great trailing habits are also available from selected wholesalers. Fast growing and an excellent filler in any landscaping scheme flower colours vary from white through to pinks and reds. Verbena varieties are available from wholesale growers in pots at around 14cm as well as trays. The ‘Lascar’ hybrids being particularly popular, including the wonderful white flowering variety, very compact and looking great in a container. 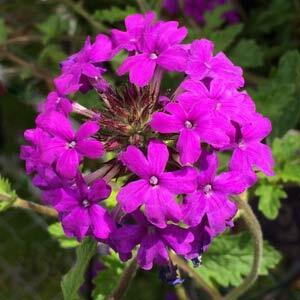 Verbena are excellent plants for the garden, container, hanging basket as well as for window boxes.